Our entire team is dedicated to providing you with the gentle, personalized dental care that you deserve. Part of our commitment to serving our patients includes providing information that helps them make more informed decisions about their oral health needs, all in a warm and comfortable environment. Personal relationships are at the core of everything we do, and we look forward to getting to know you and the rest of your family. Do you wish you had a more attractive or confident smile? Our Creve Coeur dental team is uniquely qualified to meet your every goal. With our comprehensive selection of services, we can help create a beautiful healthy smile, sometimes in as little as one visit! We invite you to come and discuss your dental health goals so we can provide you with information regarding treatment. We want every cosmetic treatment plan decision to be a shared one. 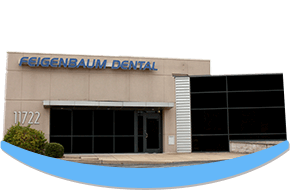 Your smile is in good hands at Feigenbaum Dental. Our experienced staff is friendly, courteous, and well-trained — and we are devoted to restoring and enhancing your natural beauty using the latest in cutting-edge dental techniques and technologies. We provide patients with extremely personalized and gentle service, and we are committed to offering our highest standards in excellence. With our expertise, commitment to continued education, and high-tech equipment, we will help you achieve the best treatment possible – all in a warm, welcoming environment.